It seems like most places have water restrictions nowadays. For some reason it seems weird that we have them here. We are always in danger of a flood. It sure doesn’t feel like water is scarce in our area. Sweet I love Biff’s resourcefulness. oh yes, i like, very nice! ah, yes. using the neighbors water. gotta love it. its best to use it around 2 am, since they are usually sleeping. smart man, that biff. He’s a tricky one, that Biff! I live in California, so it seems we’re always having water conservation, energy conservation, the whole nine yards. It’s a fairly simple logic; a lot of water supply comes from underground aquifers, which aren’t being replenished anywhere near as fast as they’re being pumped. Plus snow packs and high-altitude glaciers are shrinking around the globe, as the yearly precipitation doesn’t add up to what it used to, and so overall water levels are diminishing; one look at places like Lake Mead makes it pretty clear that something’s gone awry. Really, there’s a whole hell of a lot that’s gone awry, and people just haven’t been affected enough to notice, or if they have, only to get annoyed at being inconvenienced, rather than realizing what is, ultimately, at stake. Wouldn’t it just be easier to have some place to store rainwater in? We have this big hole in the ground where all our rainwater ends out in, and we just use that water for spraying our garden. Heh… I love it when people try to apply logic to situations where logic has no place..
Out of every Biff comic I’ve ever read, (which is all of them) THIS one is definitely the funniest. We dont have water conservation here, but I do find this funny on the fact that state laws come up with some funny rules. Why od numbered days? Why even bother with using hoses? Why even bother how long you use stuff as long as its how much is used? And why am I asking myself these questions when they are largely ignored in the Biff context of the comic? Insane Lad is right, why add logic to a comic that has no use for it? And we get hell lots of rain in this part of the world, sometimes more rain in a day than some countries in a month! We just let the grass on our lawn wither and die to be replaced by hardier things. In England we seem to have hosepipe bans as soon as we have a few sunny days- though that might be because our water pipe systems are leaky. Frankly, it would be cheaper to purify seawater. I live in a rain shadow desert. You’d think we’d have water restrictions. Nope! Reminds me of an episode of King Of the Hill. @fishmeester: That’s assuming you *get* the rainwater; where I am we don’t get much rain, and there’s been less and less for the past few years running. I’m lucky that I live above an underground river and have a well tapping it; we keep getting legal battles from the city nearby trying to seize the water rights to make sure no one has to sacrifice their never-used backyard pool or ridiculous lawns. Water is free almost everywhere here in Northern Sweden. Of course we have huge lakes that serve as (never tapped) spare water supplies cause it’s so clean water it becomes serviceable for drinking with minimal filtering. I remember living in a city that had an interesting rule regarding snow-laden streets (that might shed light on the “odd-numbered days” portion of this comic). When there was enough snow on the streets that it needed plowing, there was a city ordinance that required vehicles to park on the even-numbered side of the street on even-numbered days and the odd-numbered side of the street on odd-numbered days. This ensured that there was enough room for a snowplow to plow the road and, if there was still snow the next day, allowed both sides to get plowed. 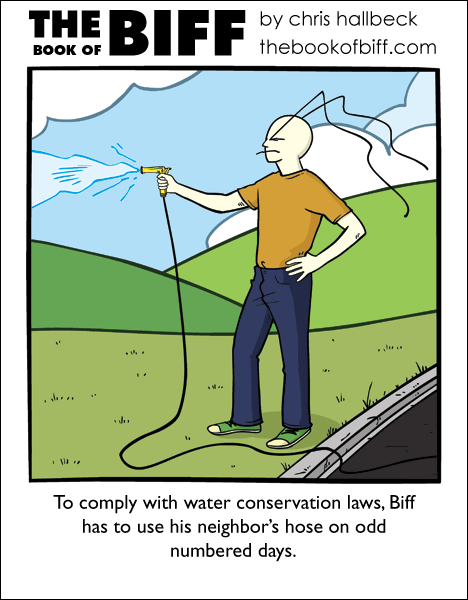 If the water conservation laws are similar, Biff’s house must have an even number because he needs to use the hose from an odd-numbered house (the other side of the road) on odd-numbered days.